PHP and MySQL use is so prevalent that now-a-days it is hard to miss seeing a website on the net which has been built using these technologies. And it is not a mere coincidence that most of the PHP/MySQL websites are hosted on Linux based servers. The beauty of PHP is in its open nature and the rich set of libraries and modules which imparts a lot of power and flexibility to the programmer. Similarly MySQL is a free database which is ideal for use as a backend for any website. And not surprisingly there are a plethora of books in the market which explains these two topics. One such book is "Beginning PHP and MySQL 5 from Novice to Professional" authored by W.Jason Gilmore and published by APress. Spread over 860 pages and divided into a whooping 37 chapters, this book covers the PHP Language and MySQL database in detail. As the name indicates, the book endeavors to hand hold a newbie in the various aspects of PHP programming like the language constructs and progressively brings him to the level of a professional. The first 21 chapters of the book solely concentrates on PHP where the author explains with the aid of examples how to write good programs in PHP. The author starts the narration by giving a brief history of PHP and then moves on to explain all the syntax constructs of this language in great detail. Arrays, functions and classes have each been provided separate chapters of their own. Usually I have found many books related to programming jumping straight into describing the language syntax and about writing code. But this book has a dedicated chapter each covering how to setup and configure PHP and MySQL on ones machine irrespective of the OS being used which breathes some fresh air to this subject. PHP language has a very good similarity with C/C++ at-least in the syntax. And in the sixth chapter, the author explains the Object Oriented Concepts like object cloning, inheritance and polymorphism of this language with clarity. The maturity of any programming language is gauged by the type of traps that it has developed to check the errors and exceptions that might be generated dynamically when a program is run. PHP has a rich set of features for handling errors. Earlier versions of PHP already took care of notifying errors through configuration directives and support for logging. But one thing this robust language lacked was support for exception handling. And from PHP ver 5.0 onwards, this feature has also been included in it. The 8th chapter in this book titled Errors and Exception Handling explains all these important concepts in detail. The fact that the author has provided snippets of code to illustrate each concept that is explained goes a long way in understanding this topic. Another of PHPs strengths is in its support of a rich set of regular expressions and string manipulation functions. Using regular expressions, one can match just about any string or a sub-set of it and even do manipulations to the matched string on the fly. The string matching functions form the backbone of many user input validations. In the 9th chapter titled "String and Regular Expressions", the author explains with the aid of code how to use the rich set of string manipulation functions available in PHP to get the desired results. The 10th chapter dwells completely on working with files and operating systems where the author explains in his inimitable style different ways of reading from and writing to files. All the frequently used file manipulation functions are explained in this chapter with the aid of examples. The first 12 chapters of the book concentrates on explaining the PHP language to the readers. In the next 4 chapters, the author moves into practical aspects like explaining how to mix PHP with HTML elements, user authentication , handling file uploads, sending and receiving email using PHP code and so on. I found the section where the author explains how to build specialized programs such as a port scanner, subnet converter and bandwidth tester all with the aid of PHP code really fascinating. The author introduces the reader to some of the MySQL concepts in this part of the book like connecting to a database and reading data from database but the more detailed aspects of database manipulation are left for later chapters which deals with MySQL in more depth. The 21st chapter titled Secure PHP programming throws light on topics related to enhancing security while coding in PHP such as enabling safe mode for people who run PHP in a shared-server environment, PHP's encryption capabilities, securely configuring PHP via its configuration parameters and so on. From the 22nd chapter onwards, the book takes an all together different turn and moves into explaining the database concepts which plays an important part in any dynamically generated website. More specifically, the succeeding chapters concentrate on explaining the configuration and use of MySQL 5.0 and how one can use PHP to interact with the MySQL database. The chapter titled Introducing PDO throws light on the abstraction layer used between PHP and MySQL. I especially liked the 26th chapter where the author lists the different MySQL clients which are available to the user like mysql, mysqladmin, mysqlshow and so on. In fact, each and every tool which comes bundled with the mysql server is explained thoroughly with the aid of examples. But that is not all, this chapter also explains how to configure a mysql database using third party clients like PHPMyAdmin, MySQL Query Browser, MySQL Administrator and Navicat. In the section on securing MySQL, the author goes into the finer nuances of the topic. For example, with the aid of commands, the author explains how to make sure that the user connects with the database over secure sockets layer (SSL) or ways of encrypting the MySQL database traffic which is an eye opener. 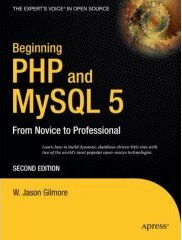 But I would say the 29th chapter titled PHP's MySQL Extension is the most important chapter in the entire book just because it is in this chapter that the author explains in detail the variety of ways in which one can connect to MySQL database and retrieve or manipulate the data using PHP code. In the 30th chapter titled PHP's MySQLi Extension, one gets to know how to use the enhanced MySQLi extension to connect to the database. The MySQLi extension contains more enhancements over its predecessor in that it is object oriented, supports prepared statements, provides transactional support, has better debugging capabilities among other things. But the down side as the author puts it is that it requires PHP 5.0 for it to work. The last six chapters deal with special features of MySQL and how one can write PHP code to use those features. The features like stored routines, MySQL triggers and Views have been provided with a dedicated chapter of their own. And yes, from MySQL ver 5.0, support for views have also been incorporated in the database. And the fact that this book covers these new topics in detail makes this a truly useful book not only for budding programmers but also for the gurus among us. W.Jason Gilmore has developed countless PHP and MySQL applications over the past seven years, and has dozens of articles to his credit on this and other topics pertinent to Internet application development. He has had articles featured in, among others, Linux Magazine and Developer.com, and adopted for use within United Nations and Ford Foundation educational programs. Jason is the author of three books, including most recently the best-selling Beginning PHP and MySQL: From Novice to Professional, and, with coauthor Robert Treat, Beginning PHP and PostgreSQL 8: From Novice to Professional. These days Jason splits his time between running Apress’s Open Source program, experimenting with spatially enabled Web applications, and starting more home remodeling projects than he could possibly complete. I really liked the layout of the book. Each section is accompanied by PHP code snippet which shows how it is done. Just because one gets two books at the price of one does not mean that the book is short on detail. In fact the opposite is true and the 860 pages contain all that is needed for coming upto date with the latest version of PHP and MySQL. Of course the inclusion of a couple of pages giving a complete project such as a shopping cart application at the end of the book would have imparted a nice touch especially since this book is targeted mainly at beginners. But that is a minor detail and I guess there are limits to which a books of even this size can cram information. All in all an informative book which gives good value for money. But I have one question: what's considered a newbie for this book? A person who never programmed —not even HTML but knows at least intermediate linux or a person who is newbie both in programming and linux? This is a book which is targeted at a newbie in PHP and MySQL. I wouldn't say a newbie in programming though. Also knowing Linux is not mandatory to learn php but as most PHP based websites are run on Linux servers, it helps to have an understanding of it. Of course, there is a lot of information especially in the latter part of the book for more experienced PHP and MySQL programmers too. After all as the newbie progresses through the chapters, it is believed that he goes through a gradual change to a professional - The book title says Newbie to Professional :). I think this book is a "must" for every PHP programmers.